Answering this question is more difficult than you might think. Some will bundle South Africa in with most of the southern hemisphere and the USA as ‘New World’, whilst others will place it alongside Europe and Asia as part of the ‘Old’. Certainly, winemaking in South Africa stretches back much longer any of the other New World countries, with the first grapes pressed for wine in 1659 under Dutch settler Jan van Riebeeck. And yet in important and very real ways, South Africa’s winemaking history is one of the youngest on the planet. A modern industry emerged only with the fall of the apartheid regime. It was as recently as 1990 that South Africa’s Wines & Spirits Export Association was created and a Wine of Origin scheme established. That was the same year that the world looked on as Nelson Mandela walked free for the first time in almost three decades. So it is still less than 20 years since South Africa’s winemakers have been able to travel freely and its industry able to trade on equal terms. This is a very young industry indeed, and one that is developing, exploring and maturing. With that comes growing pains: echoing cycles that Australia, New Zealand, Chile and Argentina have already gone or are going through, South Africa is only now learning from its mistakes, pushing into new territories, really understanding its soils and mapping its grapes to its terroirs. Just as Chile has pushed viticulture north to new Valleys in Limari and Elqui, and Argentina has pushed south into Patagonia, South Africa’s winelands have spread out from their traditional heartland around Stellenbosch, Paarl and Franschhoek. Far to the north, Swartland, Tulbagh and Philadelphia are new hotbeds of cutting edge winemaking, where maverick winemakers have established a reputation for cooler climate varieties including Syrah. Stretching to the east, Elgin had only one winery and three farms when I last visited, yet now there are eight estates and dozens of established names sourcing fruit from this apple-growing territory. Now the move is even further east, with new plantings in the wild coastal area around Elim and Cape Agulhas. South of Cape Town on the Cape Peninsula, hardy souls have also planted vines with already excellent results from Sauvignon Blanc and Sémillon. There are even experimental vineyards planted at altitude in KwaZulu-Natal, on the Eastern side of the country. In terms of wine styles and grape varieties finding favour, the debate around Pinotage still marches on, the winemaking fraternity standing either side of a schism on whether the grape is South Africa’s trump card, or millstone. One supporter, Mike Ratcliffe of Warwick estate, says “Pinotage plantings have halved over the past 10 years. We are in the middle of a process of natural selection, with the worst Pinotage vines – or the vines people didn’t care about – being lost and only passionate growers remaining.” This, he says, is improving standards radically. “Pinotage still has the ability to make bad wines more often than other varieties, so we need to get it right, but the world needs regional quirks and diversity and Pinotage is part of that.”Syrah and Sauvignon Blanc are flavours of the moment, though there is diversity with evangelists planting Italian, Spanish and Rhône varieties as well as lots of quirkier one-offs. Others stick to tried and tested favourites including Chardonnay, Chenin Blanc and Riesling for whites and Cabernet Sauvignon, Merlot and Pinot Noir for reds.Leaf-roll virus is a continuing problem for some Cape vineyards. The virus doesn’t affect the vine in mid-growing season, but as soon as the vine is stressed the virus causes the leaves to change colour and whither and the plant starts looking after itself and not the grapes, which are stopped from reaching full phenolic ripeness. So far there are no effective cures, though guaranteed virus-free vines are available, and extensive replanting is widespread in the Cape, using this new material. South Africa’ hosting of the FIFA World Cup soccer tournament in June 2010 will focus a huge amount of attention on this beautiful and energetic country, and is a chance for South Africa – and its wines – to really shine on a global stage. And yet despite South Africa’s efforts to redress the imbalances of the apartheid era and to support formerly disadvantaged sectors of the community, there is still a palpable air of uncertainty about exactly what South Africa’s political and economic future holds in store. The African National Congress is the majority party in the National Assembly, and controls eight of the country’s nine provinces. However the only province it does not control is the Western Cape, home to the white-dominated wine industry. Here the opposition Democratic Alliance holds power, and that is seen as a potential source of future conflict by some, despite Black Empowerment projects in the wine industry and some genuine moves to redistribute wine wealth and responsibility. Here are my notes from visits to a number of different regions, and dozens of the Cape’s most interesting producers. Profiles of each, plus tasting notes on their wines follow. Arriving in the small town of Riebeek-Castel, a couple of hours north of Cape Town, and there’s a charming, laid-back rural feel that seduces you. A number of craft and coffee shops line the little main street, many with colourful, hand-painted signs that give the town a certain alternative, flower power air. Indeed this valley is where a lot of Cape Town’s 60’s drop-outs dropped in and stayed, though today it is a reputation for some of South Africa’s most iconic Syrah wines that has really put the region on the map. The Swartland story really started with Charles Back of Fairview Estate planting his Spice Route Vineyards there, managed by Eben Sadie. Sadie eventually struck out on his own, and today his ‘Columella’ Syrah is one of South Africa’s genuine ‘icon’ wines. Big names like Sadie and Adi Badenhorst have forged a path in Swartland, to be joined by several others in this tight-knit, quality focused little enclave. I had time to visit only one cellar, that of Mullineux family wines, but without my prompting Chris Mullineux had gathered together top wines from every producer in the area to line-up alongside his own. That shows confidence, but also proves just how collegiate this small band of quality producers really is. Pioneers of wine-growing on the somewhat inhospitable Tulbagh Mountain, this eco estate is led by a new young team. The winemaking team of Chris and Andrea Mullineux established a big reputation before striking out on their own in 2007. The wines of Scali, plus other top Swartland wines including Eben Sadie’s Columella and the wines of Adi Badenhorst. From a pioneering region, south to the heartland of Cape winemaking around the bustling town of Stellenbosch. This has been the centre of Cape winemaking since the end of the 17th-century. Today it is still home to some of the Cape’s biggest names and largest operations, which have helped put South Africa back on the world map post-apartheid. There are over 160 wines estates in Stellenbosch, from the most historic farms that can trace their lineage back to the days of Jan van Riebeeck, to a clutch of new boutique operations. Stellenbosch University is also crucial to the development of South African wine. It offers the only home-grown degree in viticulture and oenology, and most of the country’s younger winemakers are graduates. It also boasts a thriving wine route with visitor facilities and attractions making it an essential day trip from Cape Town, 40 minutes drive away. The mountainous terrain offers numerous different terroirs with varying soils, aspects and elevations, together with good rainfall and a sunny, Mediterranean climate. 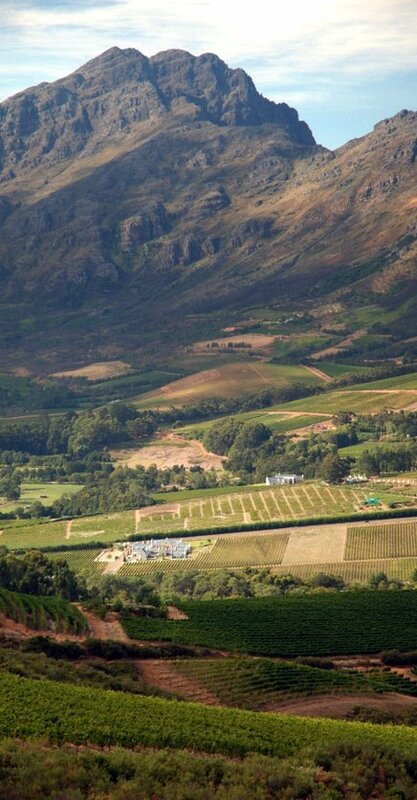 Individual sub-regions are becoming increasingly well-defined, most named after the hills and mountains where the farms are based like Bottelary, Helderberg and Simonsberg. Whether these will one day be the basis of distinct Stellenbosch ‘Crus’ is not certain, but the winemakers here are placing increasing emphasis on their own specific soils and micro-climates in differentiating their wines. Though sourcing fruit from various valleys, Neil Ellis and now his son, Warren Ellis, are stalwarts of the Stellenbosch scene. Mike and Norma Ratcliffe have ambitious and original ideas for their estate, and their premium red wine partnership at Villafonté. Their new restaurant is one of the Cape’s hottest tickets, but the quality of Jordan’s wines still takes centre stage. Winemaker Chris Williams leads a double life as the man behind this iconic Cape label and his boutique project ‘The Foundry’. Part of the giant Distell group, Fleur du Cap’s range of popular wines are made at the historic cellars of Bergkelder. Gyles Webb is one of the clearest thinkers and straightest talkers of Cape winemaking, with a brilliant range of wines. Bruce Jack retains a little of his Enfant Terrible attitude at Flagstone, though nowadays he is part of the Cape establishment. The estate of Journey’s End opened its own winery this year, but has been steadily picking up plaudits for its wines. Informal tastings with young Cape winemakers from Rust en Vrede, Tamberskloof, Uva Mira and Le Riche.